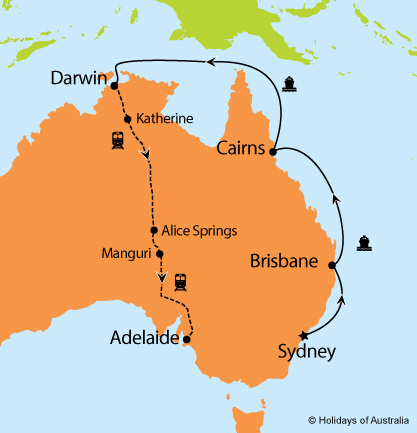 Traverse the sights of the Top End & Adelaide, cruise the East Coast, and ride the endless tracks in Central Australia. Cruise the East Coast of Australia & Papua New Guinea. Tour Darwin and experience NT life. Enjoy Central Australia by rail from the comfort of your private cabin aboard The Ghan. Conclude with a leisurely break in Adelaide.